Before us is an illustration of the famous fairy tale. Bilibin is a true master who managed to convey the special beauty of this amazing genre. Fairy tales allow us to plunge into a world full of wonders. There are herbs in it. Animals and birds can talk. A person understands them perfectly. Firebird is the real magic. With such a heroine, no bird can match. Her feathers are strangely glossy. The pen can store heat for an incredibly long time. When it goes out, it becomes real gold. A firebird is guarding a fern flower. She loves apples and then pearls of luxurious pearls come out of her beak. Ivan Tsarevich manages to find this magical bird. But still it does not work. The hero has only a feather, which he tore from her tail. The tale is extremely complicated in terms of the plot. There are a lot of characters in it. When the artist started to work, he clearly realized that there should be no independence. Everything should be exactly like in the fairy tale itself. The painter manages to make images and important ideas tangible. As a result, we better understand what is said in this tale. Spectators manage to imagine how the heroes used to live, what they preferred, how they dressed. Bilibin specially made sketches in one of the deaf villages. They were useful to him in the work on illustrations for this book. Forest wilds are depicted incredibly poetic. We feel that the painter admires aspens, pines, birches. It attracts the mystery that is hidden in them. Bilibin specially studied ancient miniatures. That is why he depicts the outfit of Ivan Tsarevich with the utmost accuracy. The motifs of Byzantium are weaved into ornaments. This artist sought to emphasize that the hero belongs to a particular genus. Bilibin’s books are a real miracle. It is no accident that his illustrations are so popular with viewers of every era. 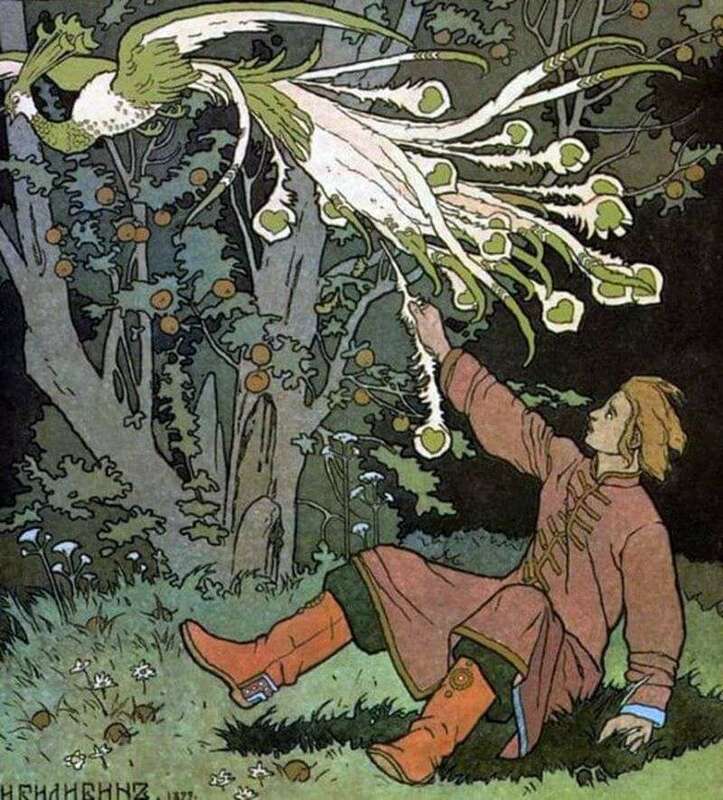 Description and meaning of the painting Ivan-Tsarevich and the fever of a bird by Ivan Bilibin.